The Indiana Pacers have continued to play solid basketball at times despite playing without All-Star guard Victor Oladipo during the second half of the season. However, this group is really struggling right now with three consecutive losses, and this contest will mark the final leg of a four-game road trip. The Pacers' balanced scoring has been one of its biggest strengths since Oladipo went out and they'll certainly need that to continue if they want to have success in the postseason. Meanwhile, the Golden State Warriors have been playing well with three victories in their last four games. What's even more impressive about that is two of those wins have come against two of the Western Conference's more elite teams in the Houston Rockets and Oklahoma City Thunder. In addition, Golden State got a huge boost when All-Star forward Kevin Durant returned to the lineup after missing time due to an ankle injury. Pacers: Indiana has had to depend on several different contributors to help fill the void left by Oladipo. Bojan Bogdanovic has continued to be one of the team's biggest producers and has scored at least 19 points in three of the team's last five games. Bogdanovic is currently averaging 17.8 points and shooting 41.9 percent from beyond the arc. If the Pacers want to have a chance against the Warriors, Bogdanovic is going to have to fill up the stat sheet. Warriors: The defending champions are certainly in better shape than they were coming down the stretch last season. This is a group that is finally getting healthy and is still able to control its own destiny. The Warriors currently hold just a half-game lead over the Denver Nuggets for the top seed in the Western Conference and are looking to lock up that top spot. 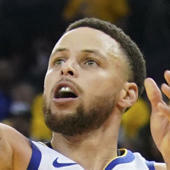 Look for the Warriors' stellar backcourt of Stephen Curry and Klay Thompson to try and put this one out of reach early in a game that they'll really want to have with such a slim advantage over the Nuggets. The Pacers are struggling in a big way as of late and really need to string some wins together if they don't want to continue to fade in the standings. However, the Warriors will be just too much at home and should come away with the victory.